Many banks offer benefits to account-holders who also have their home loan serviced by the institution. 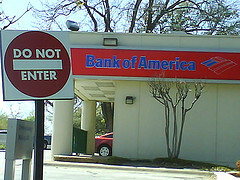 Bank of America has been doing that for years, cutting fees for people with both checking accounts and mortgages. But now BofA has gone and sold off millions of these mortgages to another servicer, starting a countdown clock for account-holders to go elsewhere or likely face new fees. The L.A. Times’ David Lazarus, who admits to being one of those affected by the move, says that BofA customers whose mortgage servicing has been sold off to a company called Nationstar won’t continue to enjoy the benefits of having a mortgage and checking account at the same bank. Instead, there is a 12-month grace period before BofA will start charging any fees for affected customers. In other words, these people have 12 months to close out their BofA account and move it elsewhere. Open your new bank account with a small deposit. Why? The safest and quickest way to move your money is to transfer the funds from your old bank to your new bank electronically. To do this, both accounts must be open at the same time. Make a list of all the automatic payments and deposits that are scheduled to go in and out of your old account each month. This is to help you organize and keep track of all of the automatic transfers that are tied to your old account, so that you can make sure there is enough money in the old account for all your payments to clear during the process of moving your money to your new account. If you have direct deposit, ask your employer to reroute your paychecks to your new account. Ask what date the first deposit will occur and use this date to guide you through Step 4. Sometimes it can take more than one pay cycle to complete the rerouting. If so, you should make sure that your automatic payments are not transferred to the new account until your paycheck is transferred. Once you know what date your direct deposits will transfer, reschedule each automatic payment or debit to come out of your new account. Make sure to ask the company what date the change will apply. Sometimes it could take one whole statement period to reflect the change. If this is the case, make sure you leave enough money in the old account to cover the payment when it occurs. Leave at least a small amount of cash in your old checking account for at least one more month. This will ensure that every payment will be covered if you happen to forget about something. The amount you leave may depend on whether your old bank or credit union charges you a fee for maintaining a low balance. If so, try to leave the required amount to avoid a charge. Once you are sure that all automatic payments and all direct deposits are coming and going from your new account, electronically transfer the final funds from your old account into the new account. Though it may take a few days before an electronic transfer clears, transferring money electronically is generally the fastest, cheapest, and safest way to move money from one account to another. Once the transfer clears in your new account, follow the procedures for closing an account at your old financial institution. Make sure to obtain written confirmation that your account is closed. Your account does not automatically close when you withdraw all of the money; you must follow the process laid out by your financial institution to make sure you close the account properly. By obtaining written confirmation that your account is closed, you can rest easy that you’ve taken the appropriate steps. If you don’t close the account, you might get hit with a monthly account maintenance fee even after you stop using it. Next Is It Okay To Change A Baby’s Diaper In Public If There’s No Restroom Changing Table? Next Up: Is It Okay To Change A Baby’s Diaper In Public If There’s No Restroom Changing Table?